Our Bollywood stars are known to sports saree blouses with bows and flared sleeves but if you think you’ve no luck in finding them, visit The H Label and you’ll change your mind. The H Label says it’s made to flatter, and we think some of its designs can truly do that. Located in Punjagutta, this is a designer label that specialises in anarkalis, ethnic capes, and sarees. But its fusion wear is also worth eyeing. 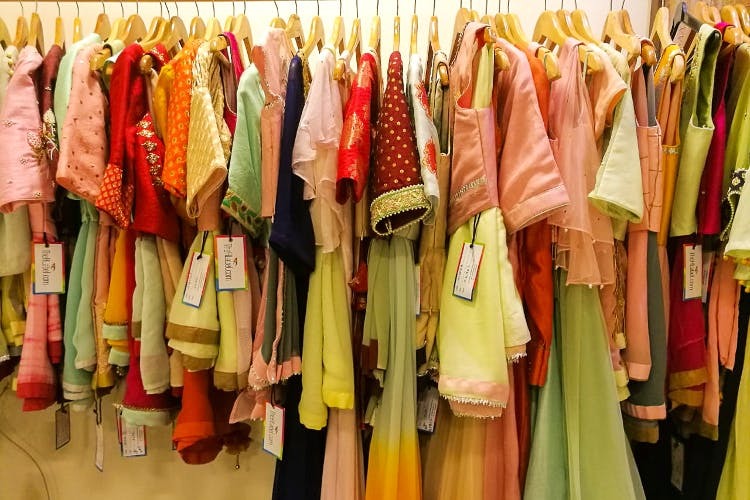 The store is rather small and when you step into it, you’ll be hedged with apparel in vivid and bright colours, that are mostly designed by young designers from Hamstech Institute of Fashion Design. The entire collection is neatly stacked and hung, categorically. So, whether you’re looking for anarkali suits, lehengas, or saree blouses, you can head over to the specific section. If you’re interested in mix and match, pick a skirt with an elaborate work and match it with a crop top. If you’re not from Hyderabad, you can explore their online store which has some of their designs. You can take your pick from their section of ethnic or fusion wear. They have ikat and kalamkari skirts that you might want to check out too. But we must admit — the label is a little expensive and only special occasions call for it.